As we come to the close of the 10 days of Repentance and are gearing up for Yom Kippor it seems appropriate to share a reflection on the movie a Serious Man. When the film came out it was lauded as the modern, or at least the 1950’s version, of the story of Job in the Bible. The comparison is obvious both Job and Larry Gopnik, the main character of the movie, seem to be punished despite not doing anything wrong. It clearly tests our notion of divine justice. What is compelling about the film is the scene pictured above. 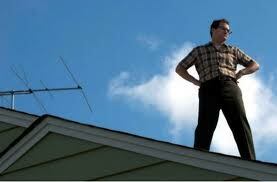 Mr. Gopnik goes to his roof to fix the TV reception and ends up ogling his neighbor sunbathing. Mr. Gopnik does not cheat on his wife with this woman, in fact it is his wife who is cheating on him. It just seems to underscore the pathetic nature of his life. This image of him on the roof asks us to compare him to David for a moment. It was David who got into trouble when he went out onto his roof and saw Uriel’s wife Batsheva. David had an adulterous affair with Batsheva and is still remembered throughout history as the paradigmatic king and the for-bearer to the Messiah. David is able to recover from doing sin because the sin itself becomes the platform for growth. Mr. Gopnik does nothing wrong, but he also seems to do nothing. Let My People... Wait, What? Let My People… Wait, What?